This was a pretty busy week. I really wanted to finish up several areas of our schoolwork so that we were done for our fall break. I didn't want to take any schoolwork with us, just some fun reading and drawing activities. So I spent a lot of time following up with kids, and also getting our lesson plans ready for December. We'll be traveling a couple weeks in December and want to make sure we are still on track. The kids are in higher grades now, so schoolwork takes longer and is more complex. My goal is to finish some electives with the boys and get through a couple classes with the girls so that we are ready for 4H season. All the kids will spend March, April and May doing Ohio History since they will finish their current programs by then. My other goal is to give them June/July off fully from schoolwork this year because of camps and fair weeks. We'll have daily reading/video times to watch documentaries and reading non-fiction books that I assign them on subjects. In Science Club, we finished up our study on cells. If you remember last week, we started an egg osmosis experiment. This was absolutely amazing!! When the shell was gone, we weighed both eggs. Put one egg in water and one egg in corn syrup. If you look around the egg shell, you can see bubbles around the egg. After 16 hours, the egg swelled immensely in size. The corn syrup egg after 16 hours. The water had escaped into the corn syrup. The corn syrup egg lost half its mass. The water egg gained an ounce. We switched the eggs and put them in opposite solutions then to see what happens. You can see the dramatic difference in the liquid levels. I highly recommend the egg osmosis experiment. It was so cool to watch. We could see the water level go down in the water bowl and the corn syrup bowl liquid level began to increase. So we were tranferring the water to the corn syrup bowl. You could see the water escaping into the corn syrup from the egg.....that was awesome!! Great way to see the osmosis process. In Art Club, we learned about the Bronze Statues of Ife. So we studied the process of bronze molding. For our project, the girls and I planned to have the kids make their own molds out of playdough. Then we mixed a small batch of Plaster of Paris and let them fill their molds. Obviously we poured wet into a wet mold. This concerned me a little. But the only trouble we had was a little playdough sticking to their project when they popped them out. Easily removed with a toothpick. We also let them make chocolate candies in molds. I simply melted some of the colored melting candy and they filled reusable molds. This was obviously a hit. The kids in Club also did the strawberry DNA extraction. They loved this. They all said it looked like spit. And then they built models of a double helix. For Bible study this week, we learned about the Complete Suit of Armor in Ephesian 6:10-17. They they built their own models using a mixture of homemade swords and breastplates to some items found at Dollar Tree. They loved this project and can hang up their armor to remind them of the importance of guarding our spirituality. 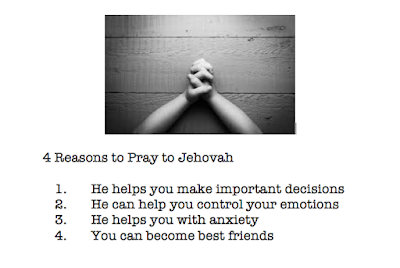 We also covered the importance of prayer, and why we need to pray. 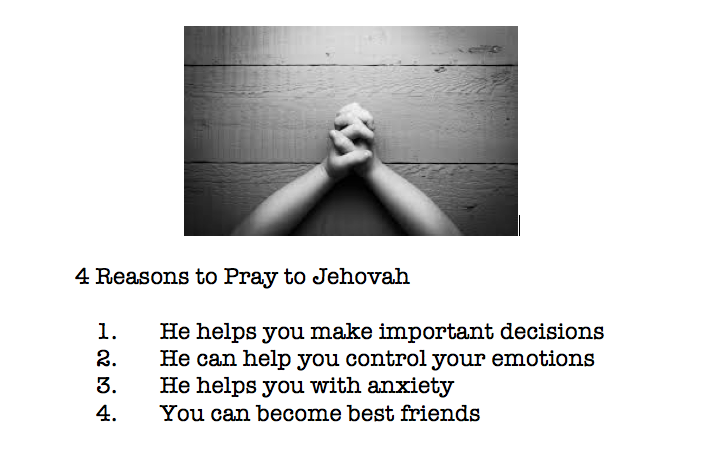 I made them each a small 5x7 poster to hang up in their rooms with the 4 most important reasons to Pray to Jehovah. In HomeEc, the kids learned about quick breads and fresh veggies for salads. Since Joey had already studied Quick breads as a 4H project, I didn't require him to bake any. Brayden made cinnamon bread (this was for dessert since Grandpa and Grandma were coming over for dinner), and Caty made doughnut muffins. Brayden's bread turned out pretty with the swirl. We added frosting to make it more "cakey". I showed Caty how I cut up my lettuce with kitchen scissors and wash it/store it for the week. This week the girls had American Girl Club. This month we read American Girl Maryellen. We learned the Hand Jive dance and talked about 1950s culture. We also made poodle notebooks for our project. Now they have drawing books just like Maryellen. In math, Caty and Joey have been working on multiplication facts. They both finished up this week. It's an ongoing memory issue, so I can't expect them to have them memorized. They'll both continue using charts as we advance in this area. Caty finished up reading Life of Fred: Farming. Brayden finished up his Fractions unit this week. He needed some extra visual aids. This fraction set from Learning Resources has been a life saver through the years. In the girls history this week, we covered Confucius, Ancient Greece (including Socrates, Plato and Aristotle and the Parthenon), the Peloponnesian Wars, and Alexander the Great. We tackled a few extra history lessons this week to make up for taking next week off from school. Then we watched a Animated cartoon I found on Alexander the Great. Brayden finished his Government class this week. Joey finished his Health book this week. Joey also finished up his Frankenstein unit. We even watched the 1931 Frankenstein with him. We also watched Young Frankenstein on Sunday night with them as a family. Brayden enjoyed that one and so did Lydia. The boys are staying on track well with finishing their work. They also finished up Story of the World Volume 1. They'll start Volume 2 when we get back from vacation. I didn't get pictures of the girls in swimming. They both found out they get to go with the State team to compete in a couple weeks. So proud of them!! Practice...practice....practice the next couple weeks. Brayden is loving basketball again this year. He whined and then he loves it. But he decided he wants to learn a lot about basketball so that he can help coach next year. So he is insistent that we not miss very many practices. This may be a stressful season for Mommy as I kill myself to make everything each week now. Caty is working hard at dribbling and walking at the same time. Thursday was such a busy day!! We had to finish schoolwork, Lydia had work, the girls had swimming practice and there was basketball practice. Joe and I decided to finish ourselves off by taking them to the midnight opening at Gamestop of Pokemon Moon and Sun. There were some games, coloring sheets and pizza. The kids love this. We may have started an annual tradition (since we did the same thing last year when the new Pokemon released). Happy kiddos on the way home! Lydia's Innovator Tribe unit this week was on roller coasters. Her project for this was to build a paper roller coaster. Her Innovator Tribe - Think Like An Engineer subscription actually includes the materials from www.paperrollercoasters.com. So we started printing and attempted to start the project as a family on Sunday. I knew it would take all week, and I was definitely right. Lydia loved the concept, but hates all the paper cutting, taping etc. So we spent literally all week at various times putting this thing together. I also had her watch an extra special on roller coasters from the TV show Impossible Engineering. I recorded it off TV, so I could find the link for a direct video on like Youtube. Her finished design.... The loops/curves at the bottom need a little more work, but that is the only spot her marble goes off track. So just a couple angle adjustments needed on those. I think it turned out pretty good. I highly recommend you check out Innovators Tribe!! They have 3 different courses. Lydia has loved the Think Like An Engineer program. We had a busy week, but we survived. Looking forward to a week off without formal lessons! !